I never like to use an oven to cook chicken breast. They can be dried, tough and rubbery on the outside and tasteless at its inside. Before baking this dish, I have heard and know about Ina Garten but didn't get a chance to cook any of her recipes. But when I first saw this Barefoot Contessa recipe at Jacquelyn's post (Marin Mama Cooks), I was very impressed and amazed how easy to cook this dish. These chicken breasts were well-flavored and every bite of them is so moist and juicy. Jacquelyn has rated this dish a perfect 10 and my family and I would rate this dish the same! For the next coming months, I was thinking of these themes, Jamie Oliver and MasterChef but can't decide to set which theme I should learn to cook at which month. Can you help me to decide? Take a closer... I can't believe this dish is so easy to cook! Preheat the oven to 400°F (or 180 °C fan forced). Warm the olive oil in a small saucepan over medium-low heat, add the garlic, and cook for just 1 minute but don't allow the garlic to turn brown. Off the heat, add the white wine, lemon zest, lemon juice, oregano, thyme (lemon thyme), and 1 tsp salt and pour into a 9 by 12-inch baking dish (mine is 24 cm x 35 cm). Bake for 30 to 40 min, depending on the size of the chicken breasts, until the chicken is done and the skin is lightly browned (I baked mine for 40 min). If the chicken isn't browned enough, put it under the broiler for 2 min (I did grilled mine for the extra 2 min). Cover the pan tightly with aluminum foil and allow to rest for 10 min. Sprinkle with salt and serve hot with the pan juices. Lets do masterchef for july and jamie for september. So excited about the current star recipe. can't wait to get hold of ina's recipes ;). I love your blog and the way you convey such a lovely atmosphere with your great recipes, your pictures and what you write! I found the best oat cookies from Ina and her recipes are so earthy with pure ingredients! Jamie and Masterchef are both good but I'd probably choose Jamie first! 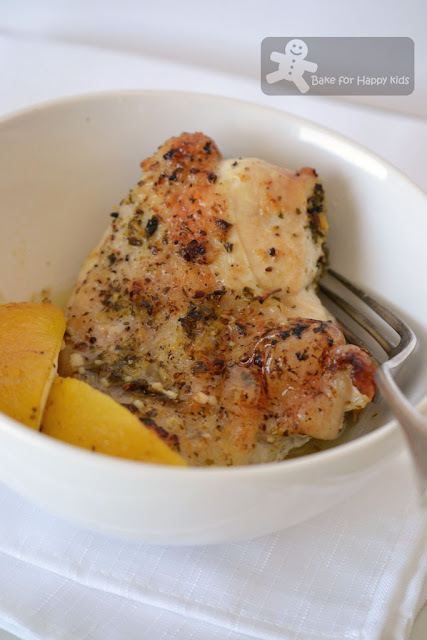 Zoe, I never like eating chicken breast but this recipe may change my view abt the breast! The 1st picture of the breast looks like thigh to me, if you didn't mention is breast, I would have thought it was the thigh! Very nicely cooked, Zoe. I'm one for Jamie Oliver. I own 3 of his books and most of my roast chicken are Jamie inspired. He's not only a great chef but he's done many good stuff for the community in the UK and the US too. So here's to Sir Jamie, I vote for him. I am looking forward to when we cook Ina Garten. I have made many of her recipes and as long as I cut back, on the fat, they are great recipes. This chicken is on my TO MAKE list. Hi Zoe! Thanks for the shout out! I am glad you enjoyed this recipe as well. I saw that you just saw my Ina Garten chocolate cake recipe. I had to post it as it's just our favorite cake. So easy and so yummy! I may try coconut oil next time instead of vegetable oil. How do you think it would taste? I will definitely participate in the Ina cook off. I have about 4 or 5 of her recipes on my site already, but I am sure I can find some new ones to cook up. I might actually make her coconut cake. My hubby's favorite cake is coconut and his birthday is in May, so it sounds like a plan. Seeing these chicken breasts reminds me that I haven't cooked them in a while and I should treat my kids to this dish again. That is the tough thing with blogging, you have to try new recipes all the time so you forget about your favorites. When I first saw your choco cake post, I knew immediately it's Ina's cake! This cake recipe is super-popular and highly rated in Food Network and I can't wait to bake this. Totally agree with you that blogging is tough because we have to try new recipes all the time. My husband and son have been requesting me to cook this chicken dish a few times but I actually rejected them by cooking other new recipes. I got to be honest my husband had been telling more than once that he really miss eating these chicken. this sounds delicious, definitely bookmarking it! 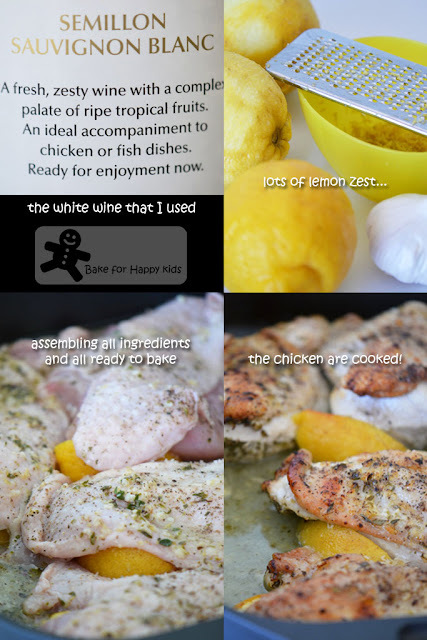 Zoe, this chicken looks delicious, I love the idea of lemon and lemon zest with all the others herbs...so flavorful! I have the same issues with chicken breast baked in the oven. You ask my Hubby - he will tell you that I always over bake the chicken. I will have to try this recipe. It might be the solution for me :) I vote Oliver, btw! Have a great week my friend! Hi Zoe, the chicken breast look delicious and moist. With lemon should taste very good. the recipe not only sounded simple but less ingredients too, havenot trie dany of ina's recipes but definately will do it comes the next'cook like a star'. I'll pick jamie oliver. I love chicken and I love lemon! This combination is so amazing and the chicken looks extremely juicy so your fears I suppose were rested. As for choosing I would go with Master Chef just to change a little things up! I usually make Rao's Lemon chicken which is very good, but Ina's (yours!) looks amazing, I have to try it! Jamie Oliver always gets my vote, his recipes have worked out well for me. Hi Zoe-thank you for following my blog...followed you right back! I love your blog and your fantastic photos, and recipes. As far as Ina's bake chicken breast...bone in; it requires 40-55 minutes to bake with the bone in, and have to keep spooning the juices over the top of the chicken to assure perfect browning and crispness. Also, I always start out on 425 degrees for the first 25 minutes to sear the meat, and thereafter, 350 degrees. You would never need to put it under the broiler this way to brown it! I often make it this way, and add fresh rosemary sprigs as well to tuck under the skin! Your cakes and cupcakes are right down to a "science"...perfect, beautiful, and very, very talented! Love the amazing "angry bird" cupcakes...simply divine! So nice of you to link to so many bloggers. As far as Jamie Oliver, I'm not that crazy about him. I used to like his early cooking programs on T.V. Great post full of good ideas. That chicken is right up my alley.Lemon is one of my favourite things. 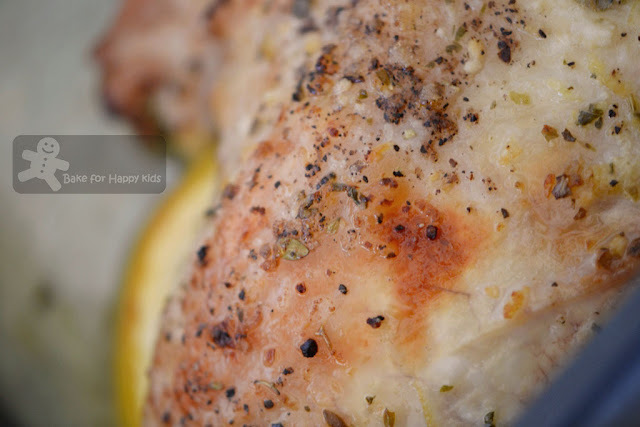 Mmmm...tender lemony chicken with the pepper kick, what's not to love! Pair with some creamy mash potatoes and it's a gorgeous meal! I vote for Masterchef! The chicken looks delicious! Have tried several of Ina's recipes before and looking forward to more. My pick is Jamie Oliver! The lemon chicken looks amazing! I love Ina garten. Actually I worship her. Her recipes are fool proof and always deliver results. I would love to participate in this event. I am always cooking from her books. Hi Zoe, that chicken definitely looks moist and delicious, I too have not tried any of Ina's recipe. I love Ina! Almost every single one of her recipes has been a hit. Your chicken looks marvelous! I have yet to make anything of Ina's thus will be delighted to try her recipes in May!